I don't usually write about cleaning products unless they're kitchen-specific. This one is a little further removed, but it's still about kitchen stuff. Specifically, my dish towels. My dish towels, over the years, had become less and less absorbent. I'd try to wipe a dish or wipe off the counter, and the towel wouldn't soak up the wetness, it would just move it around. If I wanted to get a dish towel wet, I'd put it under the faucet and water would run off until I kind of worked it in. I'd grab a towel to wipe my hands and they wouldn't really get dry. That's not how towels are supposed to work. Not. I'd heard that the problem was that fabric softener coated fabrics and made them less absorbent, but I hadn't used fabric softener in years. You'd think that the detergent would wear away the softener coating eventually, right? And it seemed like my clothes weren't waterproof - which would have actually been useful. I considered throwing out all my towels. Or burning them. Or donating them to an unsuspecting charity. But they weren't worn out or ugly. They just had a waxy buildup. Or something. So anyway, I read up on this horrifying problem, and apparently it's quite common. I followed instructions to make them absorbent again. The one that seemed to work best was to first pre-soak the towels with a lot of vinegar in the water, and then run them through the wash cycle with baking soda in the washer. I might have actually done that a few times. I might have gone through a gallon of vinegar. So, great. Now I have towels that act like towels. But how could I keep them from getting coated again? And ... completely unrelated gripe ... my bath towels were scratchy rather than soft since I wasn't using softener. Could I make them soft without softener? Yeah, not exactly an earth-shaking problem, but if I was shaking up my washing routine, I figured I'd hope for the best. That's where the Eco nuts and wool dryer balls came in. The Eco Nuts are a plant-based ... well, nut-like thing - that you put into a cloth bag (for easy retrieval) and put into the washing machine. The Eco Nuts have a naturally soapy substance in them. The dryer balls are larger than tennis balls and are a little squishy, and they're made from wool. In the dryer, they bang around and make the clothes fluffy. I've used tennis balls when drying things like fluffy jackets, to keep the filling fluffed rather than matted or compacted. It really works. but it's noisy. The dryer balls are less noisy than tennis balls, probably because they're not as hard. I like the drying balls a lot - I'm using them for all of my clothes. I just leave them in the dryer all the time, even if I'm using a softener. I'm saving the eco-nuts for use on all of my towels - both kitchen towels and bath towels. So far, so good. It doesn't seem that the towels are returning to their previous non-absorbent state, and the dryer balls make them seem fluffier than before. I'm hoping that the towels will stay absorbent long term. It might take a few years to have a final-final result, so I figured I'd post this now, after a couple months of use. If you're looking for more natural laundry methods, give these a look. Who's it for: People who do laundry. Pros: Natural product. No artificial scent. Dryer balls are better than tennis balls. Cons: My dog tries to steal the dryer balls if they roll out of the dryer when I'm gathering the clothes. Then I spend 10 minutes looking for the missing one until I realize what happened to it. Go ahead, laugh. Wishes: Erm ... it's laundry stuff. It's not like I have any wishes other than that the stuff is clean. I don't usually review cookware, even though I get tons of offers. I like to review things that are new and different, and for the most part, cookware is ... not all that innovative. When I got an email about a new type of cookware called Hexclad, I decided to give it a try. The surface had a hex-shaped pattern that intrigued me. And then it got here and I found out that the pattern was also a texture. Oooooh. Texture. It is a little lighter in weight than my other cookware and it seemed thinner, but it's still a tri-ply construction, and the surface is nonstick, inside and out. It's oven-safe and can be washed in the dishwasher, which is a plus. I cooked eggs, steak, potatoes, mushrooms, and French toast. Not all at once. But I used it every time I needed something cooked. So far, it's a nice pan. It is nonstick, for the most part, but meat browned well in it. When I was making mushroom gravy, I got a bit of sticking, but it came up as soon as I added liquid, so that was perfectly fine. I got a little bit of sticking when I cooked potatoes, but I think I might have tried moving them before I should have. The bits did scrape up easily, and washing has been easy too. I haven't put the pan in the dishwasher yet, but I probably will. Needless to say, I have no idea how long this pan will last, but I've had other nonstick pans that failed pretty spectacularly in this many uses. Who's it for: Pretty much everyone needs cookware. Pros: Nonstick. Oven safe to 500 degrees. Dishwasher safe. Metal-utensil safe. Cons: This is a new brand, so I've got no idea what to expect from the quality. Wishes: So far, there are only saute pans and a wok - no saucepans or other types of cookware. Some folks like to have a complete set. The nice folks at Trudeau sent me an email and offered me a product to review. I said thanks, but no, I've reviewed too many like it before. They said okay, take a look at this catalog and let us know what you like. I picked two things. TWO. And then they send me this big box of stuff. Big box. Of stuff. Cooking stuff. So, anyway, I photographed a bunch of different items and set it aside so I until I needed it. There's some bakeware in there that I wanted to use first, and I haven't needed to bake a cake lately. Then I decided I needed mashed potatoes rather desperately, and I remembered they had sent me a potato washer. So I unpackaged it, washed it, and put it to use. This sucker is sturdy, which is a plus. It has a handle that's easy to grip. The top handle that lets you press down is easier to use. And the design makes sense. It has a flat base with holes in it. kind of like a ricer, but instead of pushing potatoes down, you push the masher down and the spuds squeeze through the holes. The holes are big, compared to the ones in a ricer, but that makes sense. It would be immensely difficult to push the masher down if the holes were tiny. So, anyway, I mashed potatoes and the masher worked really well. The photo also shows a baster. 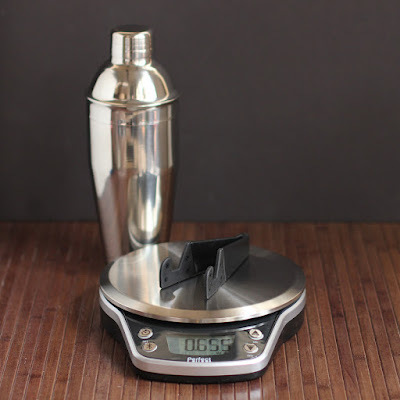 I had planned on reviewing both at the same time, but didn't actually need the baster ... but they still go together, and they'd probably be nice as a pair for a gift, right? The baster includes a cleaning brush that stores inside the baster, and there's a brush tip, so you can brush and not just squirt. I'm thinking this could be useful for applying sauces, but I haven't tried that yet. Who's it for: People who like mashed potatoes. Mmmmm. potatoes. 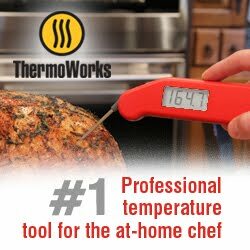 Pros: Works well, sturdy, dishwasher safe. Cons: It's sort of a single use tool. But how else would you mash potatoes, hmmmm? You could use it for mashing other root vegetables, or refried beans, if you like. Wishes: I kind of wish the color was brighter, but that's not a big deal. It's a tool, not an art object. Okay, I'm not shy about saying that I don't care for coconut, but when I got an email about this thing, it intrigued me. If you click the photo, it will take you to Amazon. If you're a coconut-lover, let me know what you think of this. If you have one, leave a comment. And if you buy it, let me know if it works! The Drosselmeyer Conecracker doesn't crack cones, it cracks nuts. I was kind of excited to get my hands on it, because I like nuts, and cracking whole nuts reminds me of my childhood. But the nutcracker sat around for a while because I didn't have any nuts in shells. I couldn't find any at the grocery stores. I knew they would show up some time before the holidays, but I got impatient and ordered both pecans and walnuts from Amazon. See how hard I work for you? I mean, really, I clicked that Amazon button and nuts were delivered. It's tough, I tell you. The cracker is kind of cool. You put the nut into the cone part of the cracker and squeeze the handle and you hear that satisfying crunch that means you're about to be munching very soon. Bits of shell fall into the body of the thing, so you're not flinging them all over the place, until you dump them out. All the nuts I bought fit into the cracker well enough that they could crack. Some fell a little further in and some stuck out the top, but they all worked. The conecracker comes in a few different colors and two price points. The less expensive one has a plastic body and the more expensive has a zinc body. I'm guessing that over time, the zinc model will last longer, but the plastic is pretty thick, so it should be sturdy, too. But ... it's possible to break plastic if you try hard enough. Who's it for: Nutty people, obviously. This would also be a nice gift item, along with some nuts. In a basket. Include a basket. Cons: Unlike old-style crackers like my mom had, this wouldn't make sense for cracking crab legs or lobster claws. Wishes: I wish it was just slightly larger. There are occasionally some really large walnuts. I like tea. A lot. But waiting for tea to brew is not optimal for me when I'm being absent-minded. I've been known to leave a teabag steeping and come back to find that the water in the mug is completely cold. The Primal Essence Super Tea is a whole different thing. Is a super-concentrated flavor in a little pump bottle. They suggest 1-3 pumps in a glass or mug. I found that one was sufficient. They sent me the Vanilla Chai flavor and Ginger Zing. I tried the ginger flavor first, and the ginger flavor was very prominent and it tasted surprisingly fresh. More like freshly grated ginger than like tea made from a dried ginger. The chai was also really nice. It had a nice amount of spice and it tasted like a lovely chai. I've tried both of these hot and cold, and I even add a little bit of the chai to some hot chocolate. Although I haven't tried it yet, I'm thinking I might try one of these in either cooking or baking. I mean, why not? I also think I might try carbonating some ginger tea. It would be sort of like ginger beer, which I really like. The weird thing is that the tea is pretty much clear. Maybe a little foggy. But not brown like a brewed tea. But I'm okay with that. How much to I like these? Well, I've already ordered more from their website. I have Lemon Ginger and Peppermint on the way. I'm pretty sure I'll like both of those just as much. Who's it for: Tea drinkers. Pros: So darned easy. Great flavor. Small bottles are easy to store or to carry along. Cons: The Primal Essence teas aren't (yet) available on Amazon or my local grocery store. Wishes: I can't wait to see if they come up with more flavors. Another box, another fun bunch of items to review. Degustabox, if you haven't read previous reviews, is a service that sells boxes of various food products. I have a free subscription, so I can write about it. So far, so good. I've liked most of the items in most of the boxes, and although I liked some boxes better than others, overall, I was happy with all of them. In each box there have been a few things I gave away - not because they were inherently bad, but simply because there are a few things I don't care for. Like coconut. Just not my thing. I needed two photos to get all the goodies in. So here we go. Brianna's Poppy Seed Dressing : I tried this on a green salad and didn't love it. I thought it was a tad too sweet. But then I tried it on cole slaw and I loved it. I think it would also be lovely on something like chicken salad. Of course, if you like sweeter dressings, then it probably would be fine for your green salad. Sharwood's Tikka Masala Simmer Sauce: I haven't tried this yet. I read the ingredients and it has coconut, so I'll probably pass this along to someone else. Bruce Cost Ginger Beer: Okay, I'll admit it. I kind of love ginger beer. It's sort of like ginger ale, but less sweet and more gingery. It's often used for making a Moscow Mule, but I like it plain. It's refreshing and adult-tasting. A wedge of lime is nice in it. Torani Single Cup Coffee : I got the salted caramel flavor, and it was insanely good. I don't use a lot of these single cups, but I really enjoyed these. The caramel flavor was definitely there, but it wasn't sweet. Just sort of ... well ... caramel-like. It was just a nice, rounded and rich flavor. Nibmor: these were two little chocolate bars that had fruit in them. One had bits of cherries and they other had blueberries. I don't usually like fruit and chocolate, but these were nice and I thought the bars were a good size. Enough to satisfy, but not too much. Oloves Healthy Olive Snacks: Um, yum, olives. I put these on a salad. I'm an olive freak. If I worked outside the house, I'd be tucking these into lunches or keeping some in a desk drawer. It's a nice little nibble. If you love olives, give these a look. Honees Cough Drops : Coincidentally, I got a little scratchy throat after these arrived and they were pretty soothing. And they tasted good, too. I might not save these for when I'm not feeling well. They're pretty tasty and a nice little sweet. Chef's Cut Real Jerky : These come in a bunch of different flavors, and I got the original recipe. If you're a jerky fan, you'll love these. I don't eat a lot of jerky, but I was happy to snack on this. It was nice on the days when dinner was running late and I was getting a little peckish. Which happens more often than I'd like to admit. Beanitos : These are tortilla-like chips made from beans. I snacked on a bag of them as-is, and I kind of missed the corn flavor from tortilla. On the other hand, the bean flavor wasn't totally weird, and worked really well when I used them to make some nachos. I received these products at no cost so I could do a review. It's an interesting show. Entrepreneurs pitch companies ideas to investors (the sharks) who might or might not invest. Sometimes one shark will bite, but sometimes two, three, or more sharks will join up to offer a deal. Sometimes sharks will bid against each other. It's fun to see what ideas they thing are worth investing in, and which aren't. Not that I want to start a business. But I like to see new products. Most of the products on Shark Tank aren't things that I'd buy, but every once in a while, there's one that piques my curiosity. Which is all good when it's something sold at a major chain. 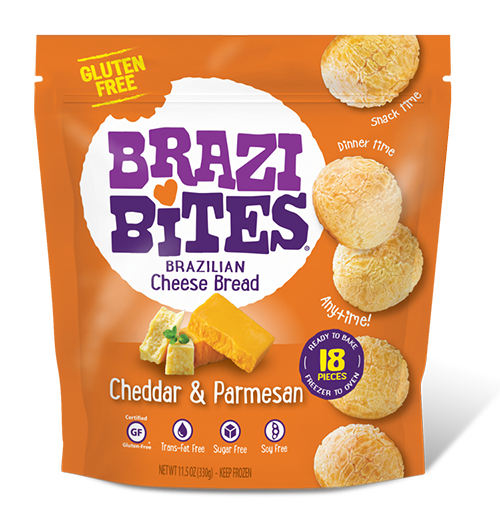 So anyway, I was watching the show and something called Brazi Bites was being pitched. They're little round Brazilian bread-like puff. Then I heard that they were gluten-free. Hmmm. I don't have gluten issues, but I'm often suspicious that gluten-free items will be ... sort of ... imitations of foods they aren't. While gluten-free cooking and baking has come a long way, those of us who can eat gluten would probably not choose the gluten-free product as their favorite. Then I found out that these little morsels didn't have the gluten taken out of them. They never had gluten to begin with. So, that's way different. And everyone on Shark Tank seemed to love them. I promptly forgot about the product after the show. Totally dismissed it from my mind. 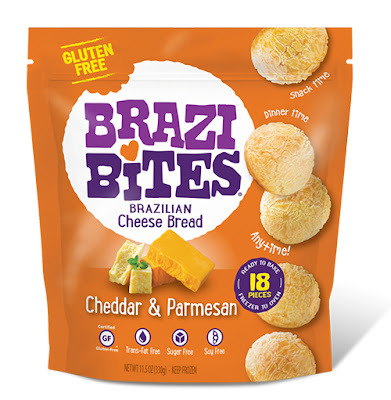 Until the Brazi Bites folks emailed me and asked if I wanted samples. Well, heck yeah! The packages arrived, still frozen. Okay, these don't come fully cooked. They're not a bakery item. Instead, you need to pop them into the oven. They start out the shape of DOTS gumdrop candies, but they bake into roundish puffs. Flat on the bottom, but otherwise round. And they had this sort of cracked, turtle-shell like appearance on top. And they're crazy good. They all have some kind of cheesy flavor, so if you're a fan of cheese ... you need to try these. I was popping them into my mouth like candy. Well, really big candy that I had to bite into. I had some with a salad. I thought about making little sandwiches. I thought about stuffing them. And then I found out they sell them at one of my local stores. So I'll be able to buy them whenever I want. Who's it for: Gluten free or not, these are really tasty. Pros: Since they're frozen, they're great for those emergency situations when you need a little bit of something bready. And ... you can bake as many as you want. No need to bake the whole box. Cons: Since they're frozen, you have to bake them. Wishes: I'd change the packaging. Recloseable bag instead of bag in a box. I first "met" the folks at GIR when they offered to send me one of their new spatulas. Spatula, smatchula. I had plenty of spatulas. But, okay, send it, I said. And it come in a ridiculous number of colors. Since then, they tend to send me new stuff as it comes out. I saw some really cool coasters and trivets (they call then Kitchen Mats) at the Housewares Show last March, but they were still in the development stage. I really liked the patterns and knew they'd be good in photos. Besides using them as trivets, the kitchen mats would be good as pot holders, or to grab a jar lid you're trying to open. Who's it for: Pretty much anyone. Pros: They have a nice design, easily washable, heat resistant. Wishes: More colors, of course. I always love more colors! GIR sends me new products now and then. Coming soon is a review of the new bottle stoppers.